The location of the recent Holiday Art and Craft Market has been turned into an open air gallery at 116 North Queen Street. 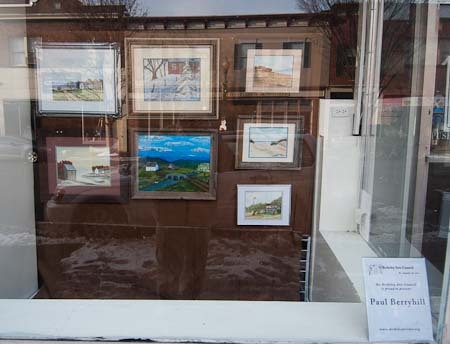 With the generous permission of property owner Carlos Niederhauser, we have installed paintings by Paul Berryhill and pottery and paintings by Hilda Eiber in the windows of the empty storefront. 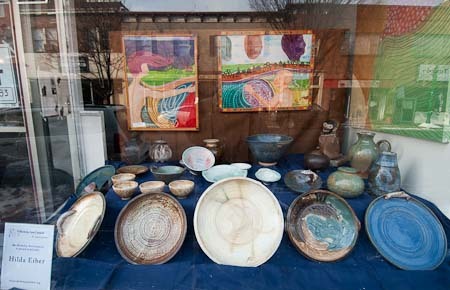 Hilda Eiber's pottery and paintings in the window at 116 N. Queen Street.